New paint throughout! Open single-level home has split floor plan with 4 beds and 2.5 baths. Master Bath remodeled in 2017 w/ frameless shower and custom cabinets. Office has built-ins convertible into a bedroom. Large kitchen opens to family room. Refrigerator and dishwasher replaced in 2015. Floors are combo of tile & solid bamboo hardwood. New carpet in all bedrooms. Custom pool built in 2013 with waterwall, fire pit, and amazing splash pad. Full remote control pool and kids can safely use splash pad without access to pool. Two elevated gardens. GigaBlast fiber for 1Gbps internet. 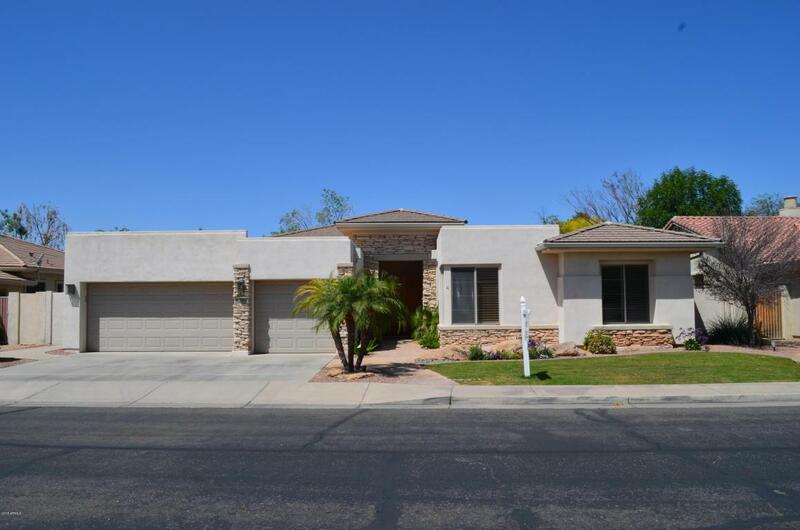 Desirable Coventry South Tempe gated community with mature trees, a large fully-lit park, tennis, a large playground. Walk to Sprouts, Vine, Crepe Bar, Ken McDonald, and Canal Multi-use Paths.